When Should You Seek Medical Care for COPD? What Is the Medical Treatment for COPD? What About Surgery for COPD? What about aftercare for a person with COPD? What Is the Prognosis for Someone with COPD? What Does COPD Look Like (pictures)? 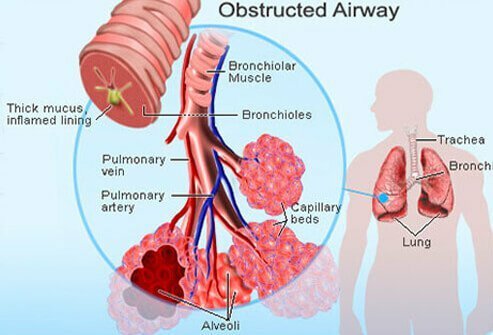 Chronic obstructive pulmonary disease, or COPD, is a permanent obstruction of the airways that occurs in varying degrees (see stages in this article) manifested in a variety of ways often exhibiting components as chronic bronchitis, emphysema, and/or asthma. This obstruction of airflow may be progressive, worsening over time. COPD is most commonly caused by tobacco abuse mainly in the form of primary cigarette smoking. Secondary smoke also may be a contributor. COPD has four stages (I – IV) with stage IV representing severe disease. Risk factors for COPD include tobacco use, (primarily cigarette smoking), asthma, occupational exposure, genetics, and age. As lungs age, some components of COPD, such as emphysema can occur. Primary care, internists, pulmonologists, infectious disease and surgical specialists are the types of doctors that treat many aspects of COPD. COPD is diagnosed by patient history, examination, and medical tests and exams. Home remedies and treatments that help soothe COPD symptoms include lifestyle changes such as smoking cessation, avoiding lung irritants, managing complications, and making sure you have a healthy eating plan. Medical treatment for COPD includes medication, current vaccinations against the flu and pneumonia, pulmonary rehabilitation, oxygen therapy, surgery, bullectomy, lung volume reduction surgery, and lung transplant. COPD can be prevented by smoking cessation and avoiding other lung irritants such as air pollution, chemical fumes, dust, and secondhand smoke. The outlook for a person with COPD depends on the stage of the disease with a fair to good prognosis if treated early, but declines steadily as the disease progresses. In the United States, approximately 15.7 million people have been diagnosed with COPD, 9 million people have chronic bronchitis, and 3.5 million people have emphysema. It is estimated that there may be an additional equal number of US citizens that have COPD, but who have not been diagnosed with the disorder. The number of people with COPD has increased dramatically since 1982. Cigarette smoking or exposure to tobacco smoke is the primary cause of COPD. Tobacco use accounts for as much as 90% of the risk for the development of this disease. Secondhand smoke or environmental tobacco smoke also increase the risk of respiratory infections and can result in a decrease in lung function. People with COPD experience a more rapid decline in what is called forced expiratory volume, or FEV. FEV is the maximum volume of air that can be exhaled within a specified time period, starting from maximal inhalation. A subscript indicates the time period in seconds. For example, FEV1 is the maximum volume of air that can be exhaled within 1 second. A decline in FEV causes a person to become short of breath and to have difficulty breathing. It is important to note, that an individual that has a more rapid decline in lung function from tobacco abuse, can return to a normal, slower decline when they quit smoking cigarettes. It is not clear if air pollution causes COPD. However, if it does, the effect is small when compared to cigarette smoking. The use of solid fuels for cooking and heating may cause high levels of indoor air pollution, which may then lead to the development of COPD, especially in underdeveloped countries where cooking with wood or coal is common. Some people who develop COPD have airway hyper-responsiveness, a condition in which their airways overreact to airborne irritants, such as secondhand smoke and air pollution. The role of airway hyper-responsiveness as a risk factor for COPD in people who smoke is unclear. However, according to one hypothesis, patients who have airway hyper-reactivity and who smoke are at an increased risk of COPD and an accelerated rate of decreased lung function. In people with chronic asthma, inflammation over time can result in permanent remodeling of the airways and result in fixed airway obstruction. It is in this way that chronic asthma becomes COPD. Generally, patients with asthma have normal lung function when they are not having an attack. It is only after years of inadequate control of airway inflammation that they can develop this fixed airway obstruction. Alpha1-antitrypsin (AAT) is a protein in the body that is produced by the liver and helps protect the lungs from damage. In AAT deficiency, the liver does not produce enough of this protein. AAT deficiency is an inherited condition, and it is the only known genetic risk factor for COPD. It accounts for less than 1% of all cases of COPD in the United States. Severe AAT deficiency leads to emphysema at an early age; in nonsmokers, the average age of onset of emphysema is in the 50s, and in smokers, it is 40-50 years of age. Most people with COPD have smoked at least 10 to 20 cigarettes per day for 20 or more years before experiencing any symptoms. Thus, COPD is typically not diagnosed until the fifth decade of life (in people aged 40 to 49 years). A productive cough or an acute chest illness is common. The cough is usually worse in the morning and produces a small amount of colorless sputum. Breathlessness or being short of breath (dyspnea) is the most significant symptom, but it does not usually occur until the the person's 50s or 60s. Wheezing is a musical, whistling, or hissing sound with breathing. Some people may wheeze, especially during exertion and when their condition worsens. Often people feel like they have frequent "colds" or "pneumonia." Many hospitalizations for pneumonia often turn out to be exacerbations of COPD. Intervals between acute periods of worsening of dyspnea (exacerbations) become shorter. Cyanosis (discoloration of the skin) and failure of the right side of the heart may occur. Anorexia and weight loss often develop and suggest a worse prognosis. Stage I is FEV1 of equal or more than 80% of the predicted value. Stage II is FEV1 of 50% to 79% of the predicted value. Stage III is FEV1 of less than 30% to 49% of the predicted value. Stage IV is FEV1 <30% of predicted value or FEV1 <30% of predicted value plus respiratory failure, sometimes termed "end stage" COPD. Early treatment can be done by your primary care physician (for example, to help you to stop smoking). Other physicians that treat COPD are pulmonologists (lung doctors), and depending on the complications and/or the disease progression, infectious disease and critical care specialists. If surgery is needed, a lung surgeon or a transplant surgeon is consulted. Individuals should see a health-care professional if they are experiencing the symptoms of COPD, particularly if breathing has become increasingly difficult. A health-care professional will perform various tests to determine if a person has COPD, and determine the best treatment for the patient. The patient will be asked about symptoms and whether the patient has smoked, currently smoke, or are exposed to secondhand smoke or air pollutants. The patient will undergo a physical examination. Although a physical evaluation is often not sensitive enough to detect mild-to-moderate COPD, the physical signs are specific and sensitive enough to detect severe COPD. Patients with severe COPD experience rapid breathing (called tachypnea) and respiratory distress (difficulty breathing) with simple activities. A sample of the patient's sputum may be collected and sent to a laboratory for analysis. A chest X-ray or a high-resolution computerized tomography scan (an HRCT scan) may be taken. An HRCT scan is often taken because it provides more detail than a chest X-ray. It is very useful in detecting emphysema. A pulmonary function test should be used because it detects and assesses the severity of lung disease. This test is also helpful in following the progress of lung disease. Using a device called a spirometer, a pulmonary function test can determine how well the lungs are functioning by measuring how much air the patient can breathe in, and how much and how fast the patient can breathe out. An arterial blood gas test may be performed. This test measures how well the lungs are doing in transferring oxygen into the blood and in removing carbon dioxide from it. A pulse oximeter, which is attached to the finger, is sometimes used to measure the percentage of oxygen saturation in the blood. The goal of the treatment of COPD is to improve the patient's daily living and quality of life by preventing symptoms and exacerbations, thereby preserving optimal lung function. If a person is diagnosed with COPD, a health-care professional will educate the person about the disease. The individual will be encouraged to actively participate in their treatment program. Smoking cessation is the most important thing a person can do to improve their condition. Stopping smoking can improve COPD symptoms. Setting a quit date may be helpful. A health-care professional will participate with the patient by setting a target date and by scheduling follow-up visits. Acute exacerbation of COPD is one of the major reasons for hospital admission in the United States. The patient may need to be hospitalized if they develop severe respiratory dysfunction, if the disease progresses, or if they have other serious respiratory diseases (for example, pneumonia, acute bronchitis). The purpose of hospitalization is to treat symptoms and to prevent further deterioration. A health-care professional will determine if a patient needs medication to relieve symptoms of COPD. The supervised use of medications is an important adjunct to smoking cessation programs. Nicotine is the ingredient in cigarettes primarily responsible for the addiction. Withdrawal from nicotine may cause a person to have unpleasant side effects, such as anxiety, irritability, difficulty concentrating, anger, fatigue, drowsiness, depression, and sleep disruption. These effects usually occur during the first several weeks after a person stops smoking. Nicotine replacement therapies reduce these withdrawal symptoms. If you require your first cigarette within 30 minutes of waking up, you are most likely highly addicted and would benefit from nicotine replacement therapy. Several nicotine replacement therapies are available. Nicotine polacrilex is a chewing gum. Chewing pieces come in two strengths (i.e., 2 mg, 4 mg). If a person smokes one pack per day, they should use 4-mg pieces. If a person smokes less than one pack per day, they should use 2 mg pieces. Individuals should chew hourly and also chew when needed for any initial cravings within the first 2 weeks. Patients should gradually reduce the amount chewed over the next 3 months. Transdermal nicotine patches are also available, and are well tolerated. The most common side effect is slight skin irritation where the patch is placed. Examples of brand name nicotine replacement therapy patches are Nicoderm, Nicoderm C-Q, Nicoderm C-Q Clear, Nicotine System Kit, and Habitrol. Each product has a scheduled decrease in nicotine over 6 to 10 weeks. The use of the antidepressant bupropion (Zyban) is effective. It is a non-nicotine aid to smoking cessation. Bupropion may also be effective for those people who have not been able to quit smoking with nicotine replacement therapies. Some people with COPD who respond well to oral corticosteroids can be maintained on long-term inhaled steroids. Advair and Symbicort contain steroids that can be inhaled. The use of these drugs is widespread, despite little evidence of efficacy in the treatment of COPD. Inhaled corticosteroids do not slow the decline in lung function. They do, however, decrease the frequency of exacerbations and improve disease-specific and health-related quality of life issues for some people with COPD. Inhaled corticosteroids have fewer side effects than oral steroids, but they are less effective than oral steroids, even at high doses. Inhaled beta2-agonist bronchodilators relax and open the breathing passages. They work rapidly, typically within minutes. Beta2 agonists are primarily used to relieve symptoms of COPD. Inhaled beta2 agonists are the treatment of choice for acute exacerbations of COPD. Several long-acting beta2 agonists (for example, formoterol, salmeterol [Advair Discus, Advair HFA, Serevent Diskus], indacaterol [Arcapta Neohaler], vilanterol [Anoro, Breo], arformoterol [Brovana], olodaterol [Striverdi, Stiolto]) are available. They may be useful if the patient frequently uses short-acting beta2-bronchodilators or if they experience symptoms at night. It is important to note that in patients with asthma, the FDA has issued a box warning on all long acting beta agonists of sudden cardiac death. This was based on data in one trial (the SMART trial) when these agents were taken alone. When used in combination with other medications, such as inhaled corticosteroids, these cardiac issues have not occurred. Maintenance treatment with aerosolized anticholinergic agents (for example, ipratropium [Combivent, DuoNeb, Atrovent HFA, tiotropium [Spiriva], aclidinium [Tudorza], umeclidinium [Incruse]) may be more effective than beta2 agonists for people with COPD, particularly in relieving shortness of breath. Ipratropium bromide opens the breathing passages and has minimal side effects. Anticholinergics also dilate airways but through a different receptor than the beta2 agonists. It is administered by a nebulizer, powder, or metered-dose inhaler. The frequency depends on the agent being used. Beta2 agonists can be added as needed. Now combination inhalers are also available, (umeclidinium/vilanterol [Anoro Ellipta] and tiotropium/olodaterol [Stiolto]). People undergoing exacerbations of COPD respond well to inhaled beta2-agonists and anticholinergic aerosols. Several options are now available combining steroids and long acting bronchodilators. Several brand names are useful in the treatment of COPD (for example, fluticasone and salmeterol [Advair], budesonide and formoterol inhalation [Symbicort], formoterol and mometasone [Dulera]) with newer agents requiring only once a day dosing (Breo Ellipta). Methylxanthines, such as theophylline (Elixophyllin, Theo-24, TheoCap, Theochron, Theo-Time, Uniphyl), are a group of medications chemically related to caffeine. 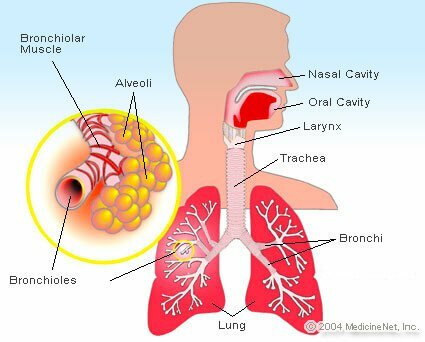 They work in COPD by opening the breathing passages. In addition, methylxanthines reduce inflammation, improve respiratory muscle function, and stimulate the brain respiratory center. Adding theophylline to the combination of bronchodilators can be beneficial, although the response to theophylline may vary among people with COPD. Their use has decreased over the last decade because of the risks of unwanted side effects. Side effects include anxiety, tremors, insomnia, nausea, cardiac arrhythmias, and seizures. Corticosteroids are used for people who do not improve sufficiently after trying other drugs or for those who develop an exacerbation (an increase in the severity of COPD and its symptoms). Oral steroids have been used successfully to treat acute exacerbations, and improve symptoms and lung function in this circumstance. Oral corticosteroids are generally not recommended for long-term use because of their potential side effects. In people with COPD, chronic infection of the lower airways is common. The goal of antibiotic therapy is not to eliminate organisms, but to treat acute exacerbations. First-line treatment choices include amoxicillin, cefaclor (Raniclor), or trimethoprim/sulfamethoxazole (Bactrim DS, Septra, Septra DS, SMZ-TMP DS, Sulfatrim Pediatric). Second-line treatment choices include azithromycin (Azithromycin 3 Day Dose Pack, Azithromycin 5 Day Dose Pack, Zithromax, Zithromax TRI-PAK, Zithromax Z-Pak, Zmax), clarithromycin (Biaxin, Biaxin XL, Biaxin XL-Pak), and fluoroquinolones. Recent data suggest that for select COPD patients chronic use of azithromycin may reduce exacerbations, and improve quality of life. But in some patients, significant hearing loss was noted. Resistant strains of certain bacteria may occur with chronic antibiotic therapy, especially strains of non-tuberculous mycobacterium (atypical mycobacteria). Mucolytic agents can reduce sputum viscosity (resistance to its flow), but may also improve sputum clearance. Some have prescribed dornase alpha (Pulmozyme) for use in COPD but it is only approved for use in cystic fibrosis. Currently, there is no proven benefit in patients with COPD. This new class of agents inhibit the enzyme phosphodiesterase type 4 involved in some of the inflammation associated with COPD. Roflumilast (Daliresp) has been shown to reduce exacerbations of COPD in select individuals, primarily those with more chronic bronchitis symptoms. Many people with COPD are unable to enjoy life to the fullest because of shortness of breath, physical limitations, and inactivity. Pulmonary rehabilitation programs are designed to improve quality of life by decreasing airflow limitation, preventing secondary medical complications, and alleviating respiratory symptoms. Pulmonary rehabilitation programs are first conducted in an outpatient setting and then can be continued at home. Guidelines for continuing this program at home will be provided to the patient. A rehabilitation program may include a number of components and will be tailored to the patient's needs. It is important to note that the exercises associated with pulmonary rehabilitation do not increase lung function. With routine exercise, patients improve the efficiencies of their muscles allowing them, along with proper breathing techniques, to increase their activity. COPD is commonly associated with worsening oxygenation of the blood (hypoxemia). Many people with COPD who are not hypoxemic at rest have worsening of their blood oxygen level during exertion. Even though studies to determine the long-term benefit of oxygen solely for exercise have not yet been conducted, home supplemental oxygen is commonly recommended for people whose blood oxygen level falls with exercise. Oxygen supplementation during exercise can prevent increases in pulmonary artery pressure, reduce shortness of breath, and improve exercise tolerance. Oxygen therapy for people with COPD may be needed during air travel because of low airplane cabin pressure. If flying, patients should arrange supplemental oxygen prior to the flight directly through the airline or through an airline agent (at an extra expense). Airplane cabins are pressurized to the equivalent of 5000-8000 feet altitude. A special test, called a Hypoxemic Altitude Simulation Test or High Altitude Stimulation Test (HAST), can help determine the need for travel when flying. Alternatively, if one lives near a mountainous area, a portable oximeter can be used to monitor for desaturations (decreased oxygen saturation) while driving at higher altitude. If any desaturations occur, drive to a lower altitude. This is not quite as easy when flying in an airplane. Sleep results in a mild decrease in oxygenation for most people. If a person's oxygen level is already borderline, sleep may result in more serious drops in oxygenation in the blood. Supplemental oxygen may be of benefit for some COPD patients during sleep. It is also not uncommon for this population to also have obstructive sleep apnea (OSA). Oxygen therapy is generally safe. Toxicity from high concentrations of oxygen is well recognized, but little evidence suggest it could be harmful at low concentrations. It has been demonstrated, that when people with low oxygen levels use supplemental oxygen, their life expectancy increases. Because of these studies, providing oxygen to COPD patients with chronically low oxygen levels will increase their life expectancy and improve quality of life. It is presumed, but unproven that using oxygen with exercise or sleep for intermittently drops in oxygen levels will also be beneficial. It definitely does help in exercise endurance in this patient group. The major physical hazards of oxygen therapy are fires or explosions. People with COPD, their family members, and their caregivers are warned not to smoke when supplemental oxygen is in use. Overall, major accidents are rare and can be avoided by proper training. Long-term oxygen therapy (LTOT) is typically delivered by continuous flow nasal cannula. This method is the standard means of oxygen delivery because it is simple, reliable, and generally well tolerated. At home, a machine called an oxygen concentrator is the usual means through which oxygen is delivered. Portable tanks provide the opportunity for people with COPD to continue their oxygen therapy while away from home. Oxygen-conserving devices enable the use of smaller, lighter, and more portable oxygen tanks. Oxygen-conserving devices function by delivering all of the supplemental oxygen during early inhalation (breathing in). In addition, they may reduce overall costs. Transtracheal oxygen delivery is invasive and requires special training by the patient, a health-care professional, and caregiver. More recently, portable, battery-operated oxygen concentrators have been developed. These are light weight and easy to use by strapping to a belt buckle. Unfortunately, these units can be expensive and sometimes are not covered by insurance. Progressive airflow obstruction may impair oxygenation and/or ventilation to the point where the patient may require assisted ventilation. The patient has a progressive worsening of respiratory acidosis (that is retention of carbon dioxide) and/or an altered mental state. The patient has significant hypoxemia despite supplemental oxygen. Over the past 50 to 75 years, various surgical approaches have been tried to improve symptoms and to restore lung function in people with emphysema. Only giant bullectomy and lung volume reduction surgery have proven useful. Bullectomy is the removal of giant bullae, which are air-filled spaces affected by emphysema located in the lung periphery. Bullectomy has been a standard approach for many years. The bullae in patients with emphysema generally range in size from 1-4 cm in diameter; however, some bullae (giant bullae) can occupy more than 33% of the hemithorax. The hemithorax is one side of the chest. Giant bullae may compress adjacent lung tissue, reducing blood flow and ventilation to healthy tissue. Removal of these bullae can result in the expansion of compressed lungs and improved function. Lung volume reduction surgery was first performed nearly 40 years ago. Surgeons generally remove 20% to 35% of the volume from the upper part of each lung, the area typically most damaged by tobacco smoking. 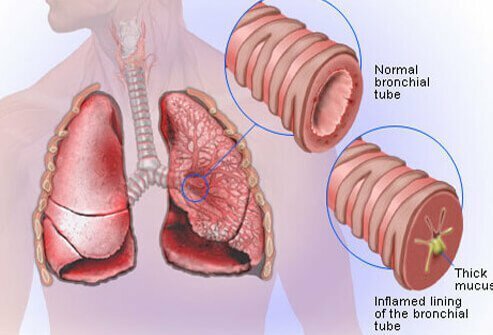 The theory is that the removal of a portion of the diseased lung increases the airway diameter in the remaining lung, and thereby improving lung function and airflow, which, in turn, reduces the symptoms. According to the National Emphysema Treatment Train Research Group, this procedure had a death rate of 6% in a study of 511 non-high-risk patients in a trial. Also, several complications can occur. The criteria in determining who should undergo lung volume reduction surgery have been defined. Generally speaking, those who do undergo this surgery have symptoms due to severe emphysema, marked hyperinflation (enlargement of airways and air spaces indicative of emphysema), and evidence of emphysema as seen on an HRCT scan. A large multicenter prospective study has shown that patients with upper lobe disease and low exercise tolerance benefit the most from this procedure. Newer procedures using valves and special devices placed through a bronchoscope have been developed to simulate volume reduction surgery, without any incisions. These devices have shown a minimal improvement in lung function in very select patients. Research in regard to these devices is ongoing. Lung transplantation may be a surgical option for people with advanced lung disease. Those with COPD are the largest single category of people who undergo this process. The timing of transplant is difficult to determine, but those selected to receive a transplant should have a life expectancy without transplant of 2 years or less due to COPD. New transplant criteria have moved patients with the greatest need to the top of the waiting list. It is therefore no longer necessary to try and predict the amount of life expectancy a patient has left. It is probably best to be referred for transplant before long term mechanical ventilation is necessary. Pulmonary rehabilitation programs are first conducted in an outpatient setting and can be continued at home. With pulmonary rehabilitation, improvements can occur in a patient's quality of life, well-being, and health status. These improvements include a reduction in respiratory symptoms and an increase in tolerance for functional activities (for example, walking, less anxiety and depression, increased feelings of control, self-esteem). Pulmonary rehabilitation also results in substantial savings in health-care costs by reducing the use of hospital and medical resources. A successful pulmonary rehabilitation program requires a team approach. Health-care professionals who have experience in treating COPD provide individual program components. This multidisciplinary approach emphasizes education for the patient and their family, smoking cessation, medical management (for example, oxygen, immunization), respiratory and chest physiotherapy, physical therapy with bronchopulmonary hygiene, exercise, vocational rehabilitation, and psychosocial support. Education is key to comprehensive pulmonary rehabilitation because it prepares the patient and their family to be actively involved in the patient's care. This reliance on the patient to assume charge of his or her care is known as collaborative self-management. Exercise training is a mandatory component of pulmonary rehabilitation. People with COPD should regularly perform aerobic exercises for the lower extremities (for example, the legs) to enhance performance of daily activities, and to reduce dyspnea (shortness of breath). Exercise training on the upper extremities (for example, the arms) improves dyspnea and allows increased activities of daily living. Breathing retraining techniques (for example, diaphragmatic, pursed lip breathing) may improve a patient's breathing pattern and prevent airway compression. Do not smoke, and, if you do smoke, quit. Eliminate exposure to smoke by not allowing people to smoke in the home and by sitting in designated nonsmoking areas when out in public. People should also avoid wood smoke and cooking smoke. Limit air pollutants in the home. Try to avoid contracting respiratory infections such as colds and the flu. Individuals should wash the hands frequently because viruses can be passed through hand-to-mouth contact. Fight for clean air to prevent those cases of COPD due to air pollution. 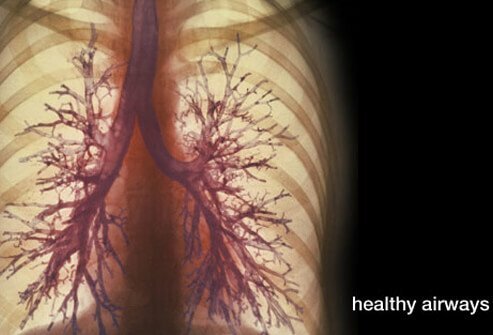 Emphysema is chronic lung disease in which the primary symptom is shortness of breath. Other symptoms of emphysema are a cough with a colorless sputum, wheezing, and short-term chest pain. Albert, et al. Azithromycin for Prevention of Exacerbations of COPD. NEJM 2011;365:689-698. Badrul A. Chowdhury, M.D. et al. The Risks and Benefits of Indacaterol - The FDA's Review. N Engl J Med 2011; 365:2247-2249. December 15, 2011. Cahill K, Stead LF, Lancaster T (2012). "Nicotine receptor partial agonists for smoking cessation". Cochrane Database Syst Rev 4: CD006103. Global Initiative for Chronic Obstructive Lung Disease. "Global Strategy for the Diagnosis, Management, and Prevention of Chronic Obstructive Pulmonary Disease." Updated 2014. Hopkinson, N, Bronchoscopic lung volume reduction: indications, effects and prospects. Current Opinion in Pulmonary Medicine March 2007; vol 13; issue 2 ;125-130. Lahzami, S., Aubert, JD; Lung transplantation for COPD-evidence-based? Swiss Med Wkly. 2009; Jan 10;139(1-2);4-8. Nelson, H.S. et al. :The Salmeterol Multicenter Asthma Research Trial: a comparison of usual pharmacotherapy for asthma or usual pharmacotherapy plus salmeterol." Chest. 2006 Jan;129(1):15-26. Rushton, L. "Occupational causes of chronic obstructive pulmonary disease." The symptoms of chronic obstructive pulmonary disease can vary greatly from patient to patient. What were your symptoms at the onset of your disease? How was your COPD diagnosed? What medications have been effective in treating your COPD? What home remedies have been effective in treating your COPD? What is your COPD prognosis? Please describe your experience with COPD.